The situation in Yemen continues to deteriorate since fighting and violence intensified in late March 2015. Virtually the entire country is affected by the ongoing conflict and humanitarian needs have increased exponentially, resulting in 80 per cent of the population being in need of some form of humanitarian assistance. More than 2.5 million people – around 10 per cent of the total population – are internally displaced as of 30 November 2015. Prior to the crisis, Yemen was hosting more than 263,900 refugees, the majority from Somalia, who require continued protection and assistance. Notwithstanding the ongoing conflict in Yemen, refugees, asylum-seekers and vulnerable migrants, the majority from Ethiopia and Somalia, have continued to arrive in Yemen in search of protection or to transit onwards to the Arabian Peninsula. In 2015 alone, 92,446 new arrivals reached Yemeni shores. Alongside internal displacement, people are fleeing the country in considerable numbers. By the end of 2015, more than 99,000 persons of concern from Yemen had been reported in countries in the East and Horn of Africa, mainly in Djibouti, Ethiopia, Somalia, and Sudan, as well as in the Gulf region. As the situation in Yemen continues to deteriorate, and based on recent trends, it is anticipated that movements to the East and Horn of Africa, the Gulf States, and beyond will continue at similar rates in 2016. Following the system-wide L3 emergency declaration for Yemen on 1 July 2015, UNHCR declared the Yemen situation an internal level 3 emergency and designated a Regional Refugee Coordinator (RRC) for the Yemen situation under the Refugee Coordination Model. The RRC ensures coherent and coordinated support on the ground for UNHCR’s response to the overall regional dimensions of the Yemen crisis. The RRC works closely with IOM and other humanitarian agencies and partners to strengthen UNHCR’s leadership and coordination role for the refugee response, and maximizes collaboration and synergies with other partners at the regional level. This supplementary appeal outlines UNHCR’s planned response to the Yemen emergency in 2016. It covers the needs of refugees and asylum-seekers of various nationalities in Yemen, internally displaced people (IDPs) and others in Yemen who are part of mixed movements. It also presents UNHCR’s response to the needs of refugees fleeing Yemen to the East and Horn of Africa and the Middle East and North Africa. 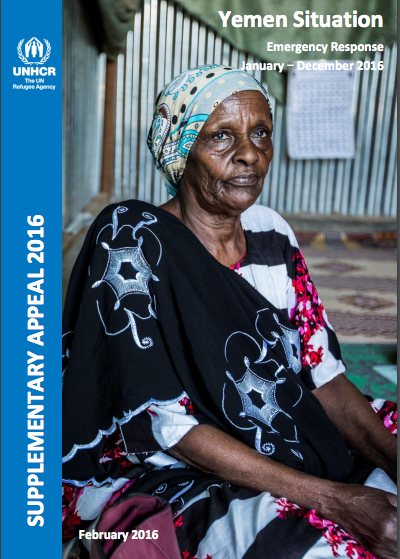 In December 2015, UNHCR together with IOM launched an inter-agency Regional Refugee and Migrant Response Plan (RRMRP), covering the requirements to provide protection and assistance to those fleeing Yemen into Djibouti, Ethiopia, Somalia and Sudan for January-December 2016. UNHCR’s response to the Yemen situation in Djibouti, Ethiopia, Somalia and Sudan as presented in this supplementary appeal is in line with the RRMRP.